Atopic dermatitis (AD) and eczema are often used interchangeably. AD is a common, pruritic, chronic inflammatory dermatosis characterized clinically by relapsing episodes of flares of intensely pruritic, inflammatory skin lesions. AD is predominantly mediated by T-helper cells with T-helper 2 (Th2) primarily in acute AD and T-helper 1 (Th-1) in chronic AD. A dysfunctional epidermal barrier function is present. A genetic component to the aetiology of AD is supported by the familial clustering. 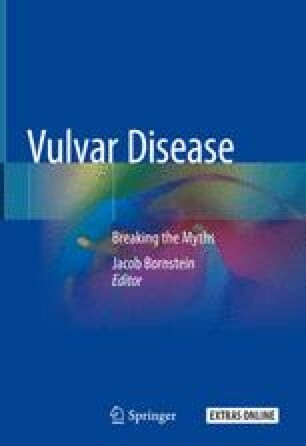 The principles of management of vulvar AD are the same in all vulvar dermatoses: remove any trigger factors, identify and treat infections and apply bland, non-fragranced emollients/moisturizers frequently to prevent transepidermal water loss (TEWL). Liquid paraffin 50% may be helpful. Control of pruritus is essential for patient relief and to reduce trauma due to scratching which also is a trigger. Mild to moderate corticosteroids are often sufficient to establish control. For maintenance use weaker corticosteroid preparations, pimecrolimus 1% or tacrolimus 0.01%.